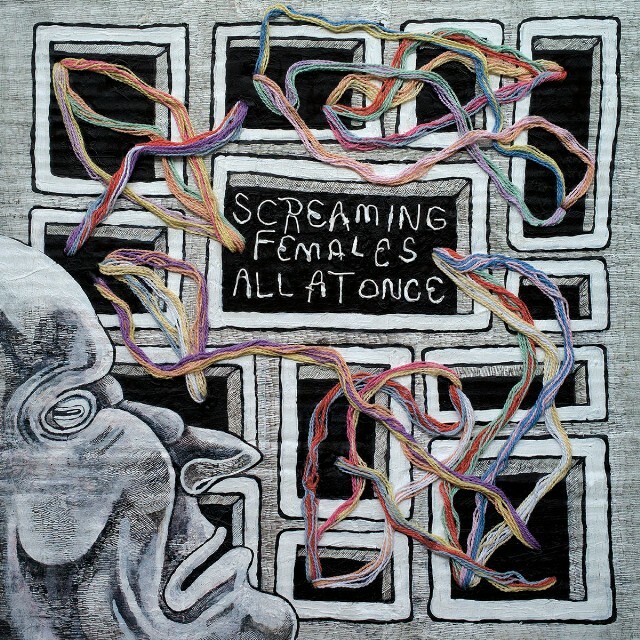 Album Review: Screaming Females - "All At Once"
The latest album from New Jersey punks Screaming Females is big, packed full of capital letters, middle fingers and multiple exclamation marks. True to its name, "All At Once" doesn't hold anything back, creating a furious DIY roar that flows, spiked and envenomed, from the throat of singer Marissa Paternoster. And really, that's been the band's approach to their work for well over a decade now. They've created music that felt bare and austere, but they've also dabbled in a sound that was far more muscular and primed for arenas filled with like-minded punks. The band reached a punk peak with 2012's "Ugly," a Steve Albini produced collection that was built from a fierce and natural power. Their follow-up, "Rose Mountain," felt a lot different and was produced by metal associate Matt Bayles (Mastodon, Pearl Jam). "Rose Mountain" was larger and more cavernous than "Ugly," although the tension and musical fury was still very much in evidence. It was simply a matter of Bayles expanding the band's idea of what they could accomplish while still working within their storied politco-punk philosophy. Their latest album, "All At Once," again produced by Bayles, continues to push the scope of their work while still clinging to that manic DIY furor. "Glass Opens" opens the record with a barrage of guitar riffs and Paternoster's inimitable voice. Backed by bassist King Mike and drummer Jarrett Dougherty, the song feels free of its indie rock-punk-garage origins and expands to fill whatever space you find yourself in. And throughout "All At Once," the band manages to break free of the confines of their own arrangements, allowing each moment to have a nuanced and devastating impact. There's a maturity here that has been hinted at on earlier records, and with Bayles' help, the band fully embraces their place as veteran rockers (if you can consider 13 years to be worthy of that particular status). From the measured melodies and subdued guitar theatricality on "Dirt" to the blistering electric assault of "Agnes Martin," the album discovers the joy and opportunity to be found by giving their collected creativities room to bloom and burst apart. These tracks are colossal and imposing, but they're able to use that power to focus attention on some remarkable bits of musical minutiae. The small moments linger in our minds (like the sparse keys and martial drums on "Deeply") even as we're bombarded by the band's more thunderous inclinations (check out the mesmerizing guitar riffs on "Step Outside" and the post-punk cacophony on "Fantasy Lens"). And by corralling both of these approaches, the soft and the loud, the measured and the feral, the band has found new mystery to explore in the vast avenues of guitar rock. "All At Once" may not be as pure a punk product as some of their earlier releases, but it does manage to do something even more impressive than keeping to any given genre. It makes the guitar feel relevant again.